Trying to get back into a regular cadence of posting. Being on vacation more than a month ago and the curveballs of life have thrown me off from daily routines (including proper diet, sleep and exercise)…. Eating pig parts has never seemed “exotic” or weird to me, as it’s something I grew up with. My mom often says that the Chinese (and those cultures with Chinese-based population, including Thailand) don’t let food go to waste — every part gets used. So when pig ears became popular at new restaurants, I had to chuckle a little bit. They’ve always been a favorite of mine growing up. Something else I grew up eating lots of was pork blood. Eaten in many different forms by many Southeast Asian countries, including Thailand, I grew up with it in soups and some curry dishes. One of my favorite comfort foods, often served at breakfast, is a soup with ground pork, pork blood, vegetables and pig parts, usually kidney, stomach, intestine — you name it. 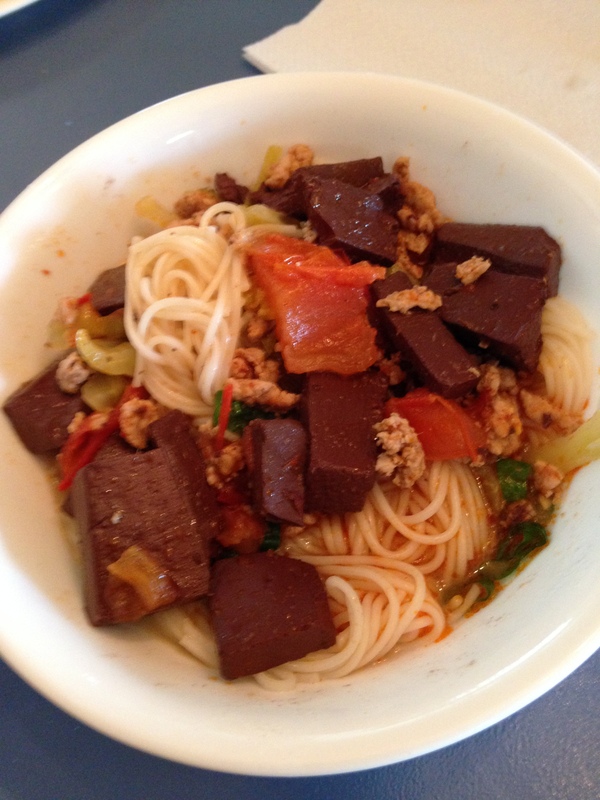 It wasn’t until much later that I realized a popular Northern style noodle dish (not khao soi) used pork blood as well. You’ll be surprised what other Thai favorite dishes contain blood. I mean, how do you think boat noodle soup is that color? Granted, the versions in the US aren’t really heavy on the blood. As I began exploring other culture’s foods, I was pleasantly surprised to see other countries didn’t waste their food either. Morcilla, or blood sausage, is also a favorite of mine. Somehow, having the blood mixed in with the sausage provides depth and texture to the meat. 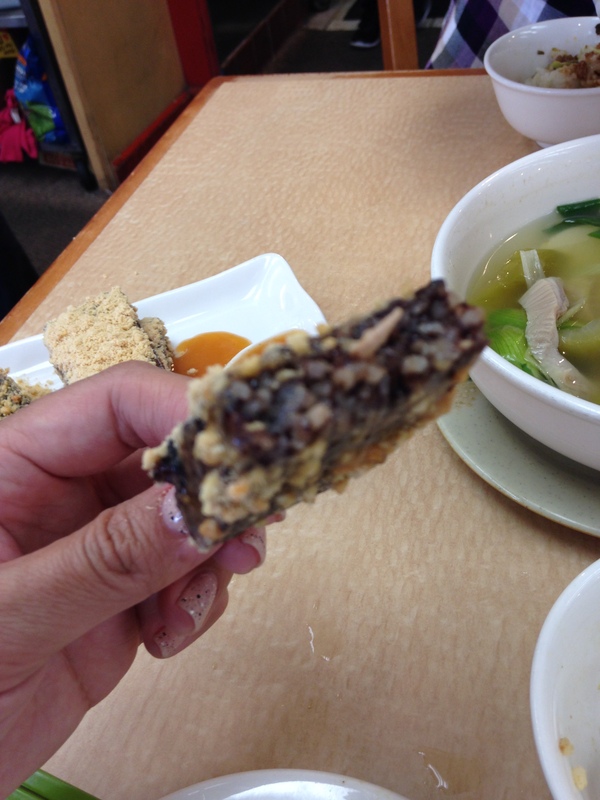 The Taiwanese have also perfected the culinary art of transforming pork blood into tasty forms by mixing it with rice cakes. I first was introduced to this form by some Taiwanese friends while we were at Taiwanese hot pot (which should never be confused with Japanese hot pot, but is equally delicious). 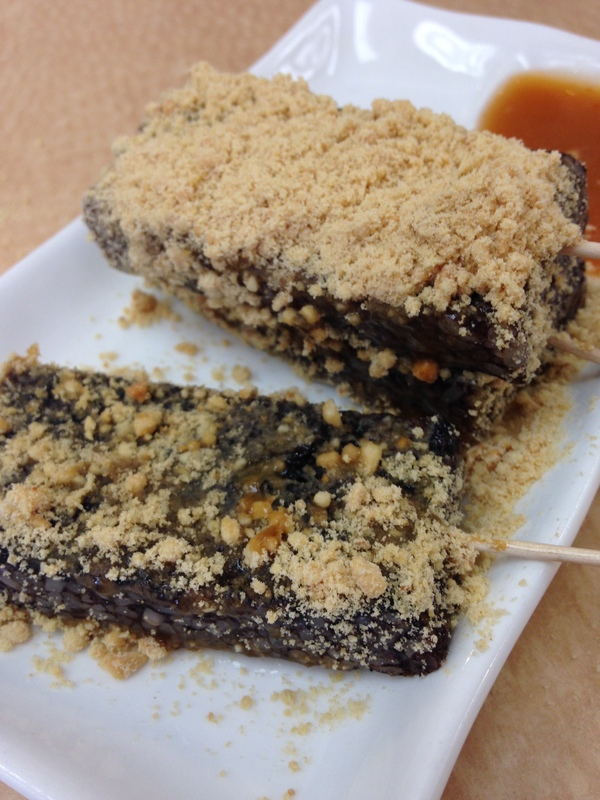 The pork blood is mixed with glutinous rice cake, masking the iron-y taste of the blood but producing a unique flavor that is delicious in hot pot, but equally as tasty in a street food version. Tawainese style pork blood cakes, here in a street food version. It’s sprinkled with peanuts and eaten with a thick peanut sauce. Perhaps my favorite pork blood product is in (surprise) Korean food. I’d first heard of soon dae from Korean dramas, then had to look it up to see what the big deal was about. Made with pork blood, rice and Korean vermicelli noodles, when done correctly, soon dae should be flavorful and not have an overpowering iron-y taste. 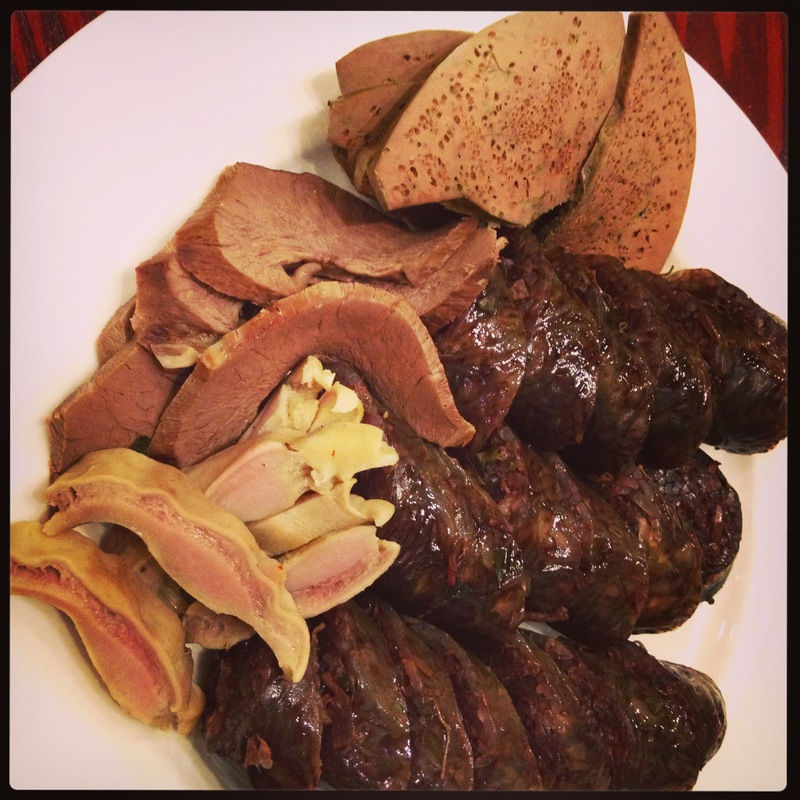 It’s often served as its own dish, with other porky friends — heart, lungs, intestines, kidney, liver — a soup, or as a spicy noodle dish (soon dae bokkum). 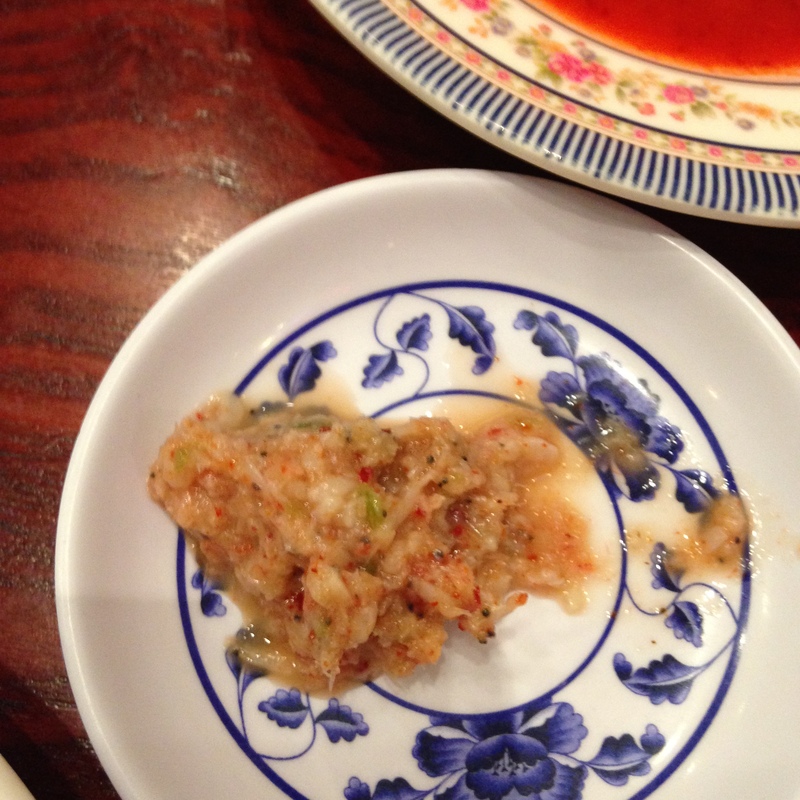 It’s eaten dipped in a Korean sea salt/pepper mixture, with Korean spicy sauce, and sometimes a Korean shrimp paste. I’m used to fermented shrimp paste, as Southeast Asians consume a version called kapi. This version was much more pungent and equally as tasty. 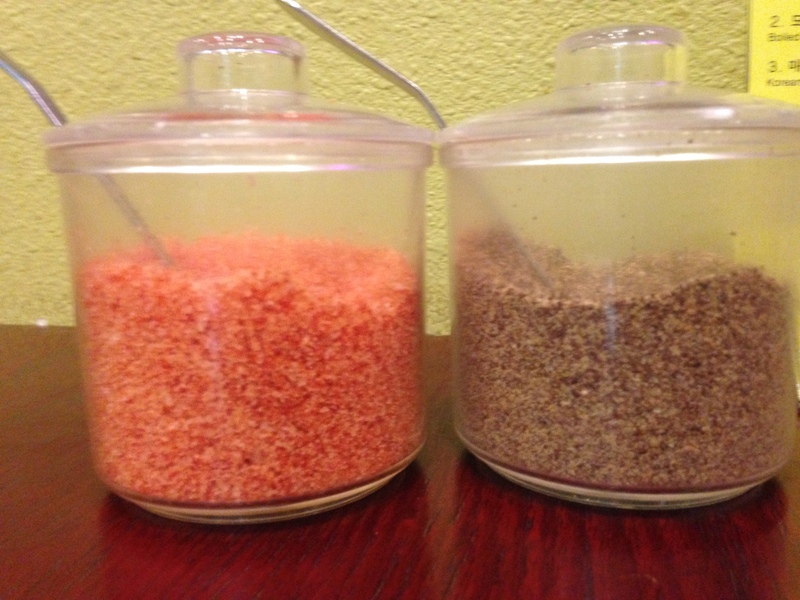 If it weren’t for it’s saltiness, I’d tried to consume it plain.